A running tap can use up to 10 litres (2.2 gallons) of water a minute. A diswasher uses between 10 and 40 litres (2.2 and 8.8 gallons) per cycle whether it’s full or not. 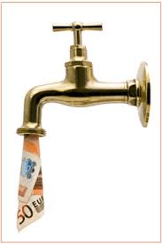 Are any of the taps in your premises dripping or overflows running? Are taps and hosepipes left running when unattended? Are the water pipes properly covered to prevent them freezing in cold weather? Are the urinals in your toilets flushing automatically? Are your customers and staff aware of their water usage? Does your Business Have a Water Leak? Find out where your water meter is. Normally your meter is located close to the property boundary in a chamber with a stopcock. If you have difficulty locating your meter, InDepth Water Management can assist you. If there is a large difference, there may be a leaking pipe. InDepth Water Management have been successfully tracing leaks, with minimum fuss, for over ten years. We only use the latest technology and our trained engineers have high success rates. Our techniques are far less invasive than traditional methods of leak detection. So if you have noticed low pressure, damp spots, constant running water and/or a high water bill then get in touch with InDepth Water Management. We are the leak detection specialists. For more information on any of our services, please contact us on 1890 72 22 22 or email us at info@indepth.ie. Water. We offer a 24/7 Emergency Call Out Service Nationwide.